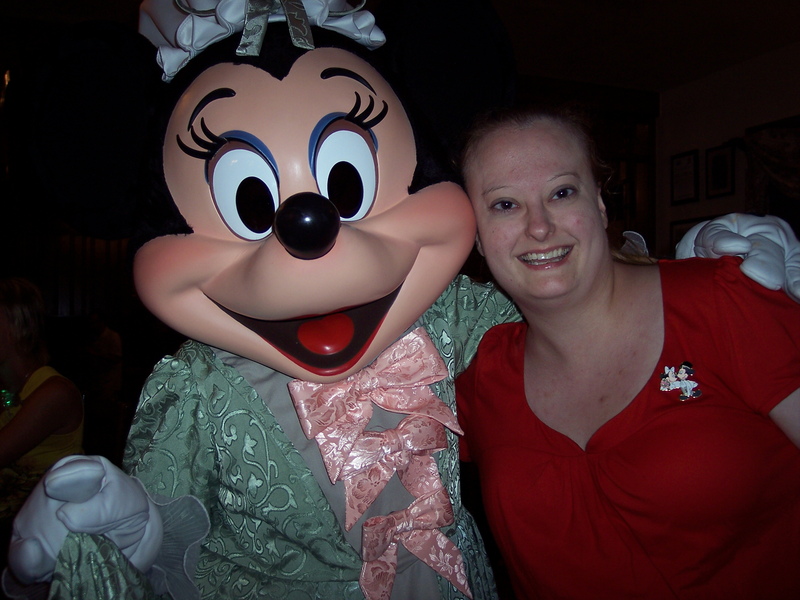 When we went four years ago, we did the Character Dining with Mickey and Friends in Colonial costumes. Although this particular Character Dining isn’t currently available, do find one that is currently active. 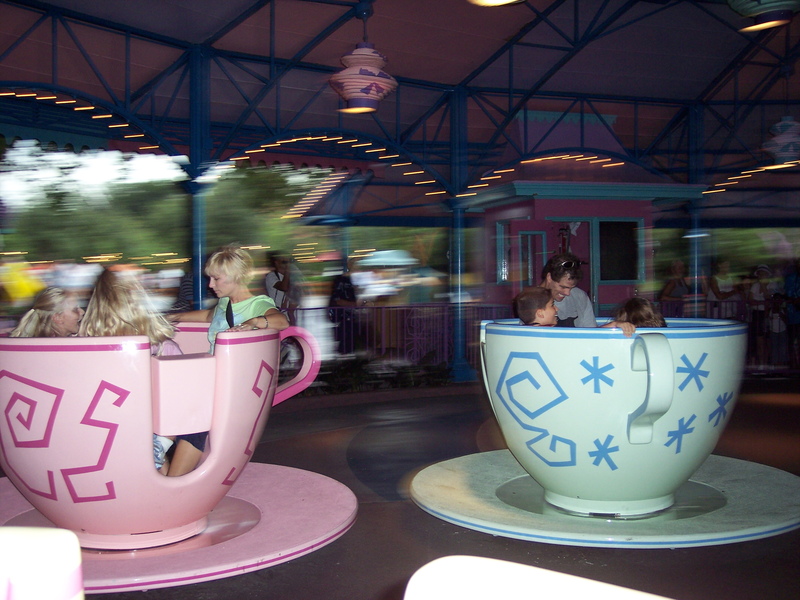 With or without children in tow, it’s a fabulous experience that only Disney can give. 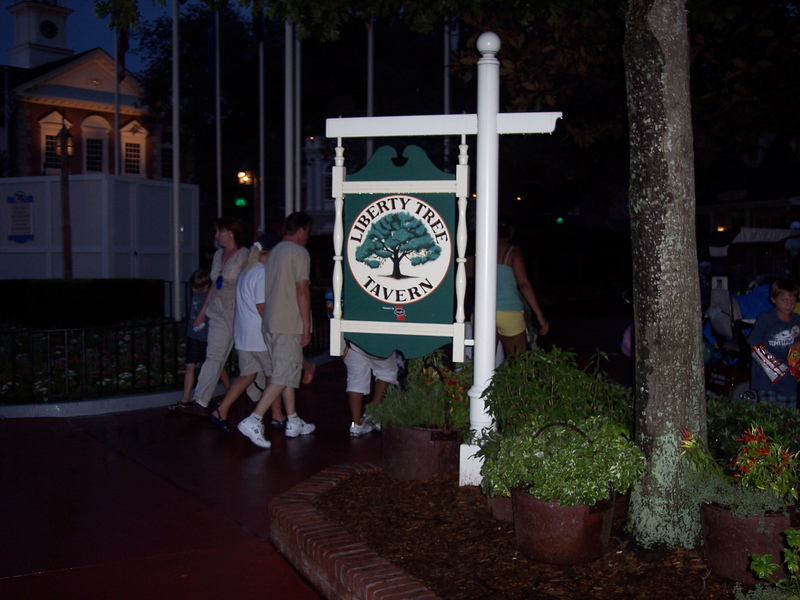 I ate here with my mom and sister on a previous trip to Epcot. The croissants are to die for. Fantastic cheese plate and excellent curry. Great food and excellent, friendly Italian waiters. They got us in during peak hours without a reservation. The tofu was excellent, and the service was topnotch. If you’re staying here, the Old Port Royale Food Court is an excellent choice for breakfast. Get the pumpkin ravioli. You won’t be disappointed. 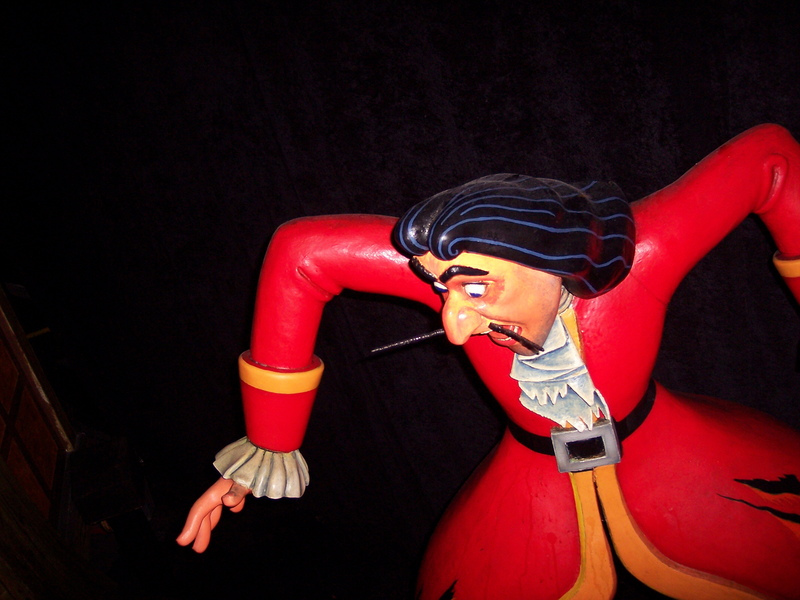 Light up Captain Hook straws! My husband and I woke up early for our first full day of Disney World adventure. I know, this was our honeymoon. Time to relax, blah blah blah. We would be hitting the epicenter of it all: the Magic Kingdom. Cinderella’s Castle overlooks the great lands of Disney. We entered through Main Street USA. Nostalgia for the “good ole’ days” hit as we passed by the early twentieth century shop windows. We journeyed on until we hit Adventureland. 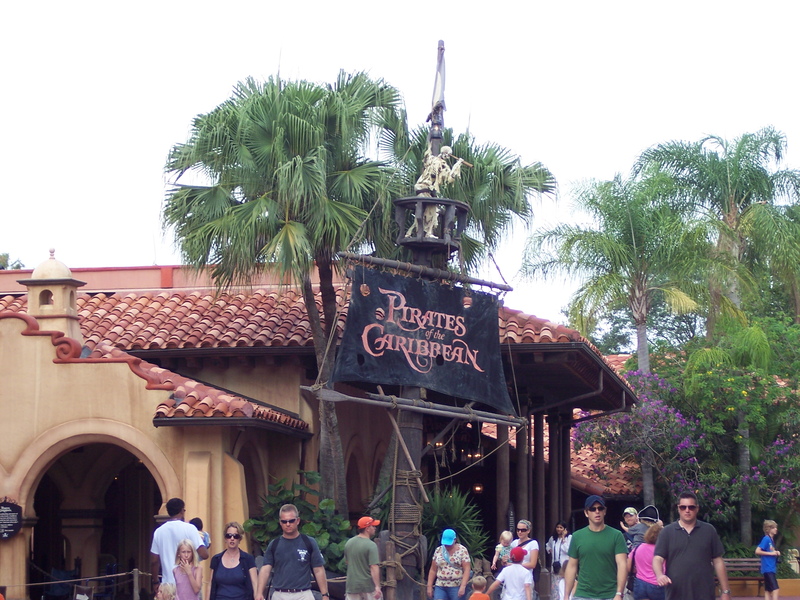 Of course, the first ride we went on was Pirates of the Caribbean. This will not be a surprise to anybody who knows us. We both typically play pirates at Scarborough and had several pirates at our wedding. We traveled through the Caribbean, getting to spot my beloved Johnny Depp THREE times as none other than Jack Sparrow. Heh hem, Captain Jack Sparrow. But alas, the ride came to an end. 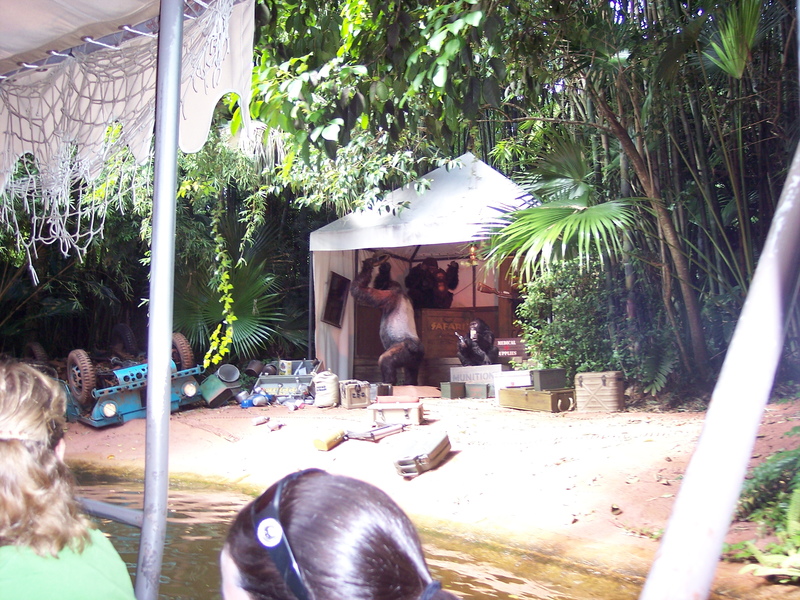 So onward we journeyed to Jungle Cruise. Now, my husband always recounts the story from his childhood about being worried about the “armed gorillas” that he heard so much about from Vietnam-era newscasts. Well, honey, they’re real. At least, they’re real in the animatronic sense of the word. The Liberty Square Riverboat took us around Tom Sawyer’s Island and to our next ride, the Haunted Mansion. My husband was really looking forward to this one. We were escorted around the mansion in the Doom Buggy. The special effects, even in our jaded age of computer graphics, have never ceased to amaze visitors. After a quick lunch in a Boston fishing tavern, we took in the Hall of Presidents, the Mad Tea Party, and my perennial favorite, It’s a Small World. 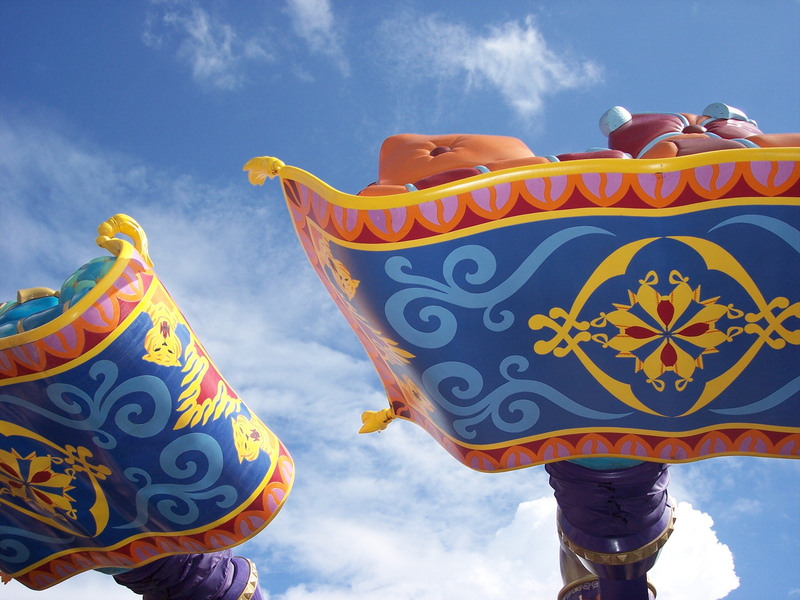 We also hit Snow White’s Scary Adventures, Peter Pan’s Flight, and The Magic Carpets of Aladdin. Time to march on to get to more rides. But the torrential rain storm left over from a hurricane off the coast hit the Magic Kingdom. Oh well, there’s lots of shops to duck into while we wait. One of the shops we came across was the Bibbity Bobbity Boutique. Love the name! Out of it came countless waves of little girls in their princess dresses, hair beglittered and wands in hand. It was a little disheartening to watch as they marched off into the downpour. Their parents probably wandered why they just spent all that money on hair glitter that was about to get destroyed by rain. Frontierland awaited us. 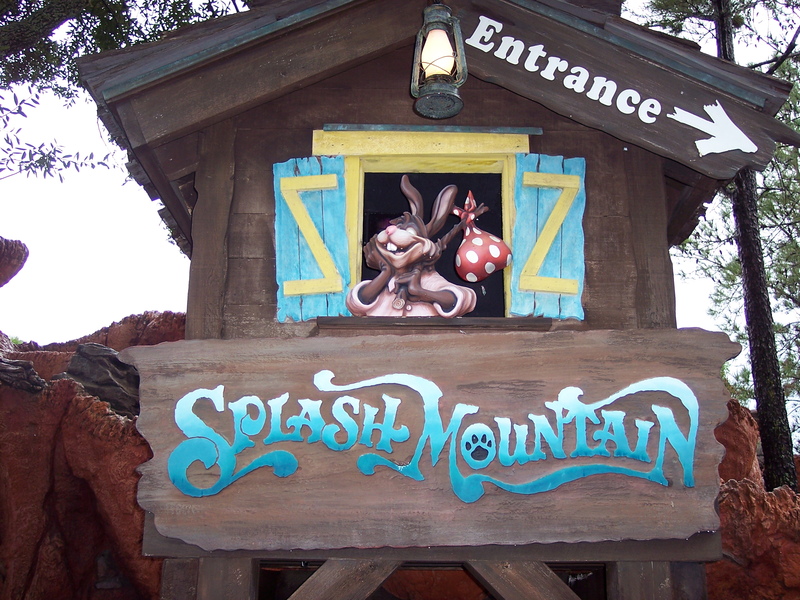 I looked forward to riding Splash Mountain. 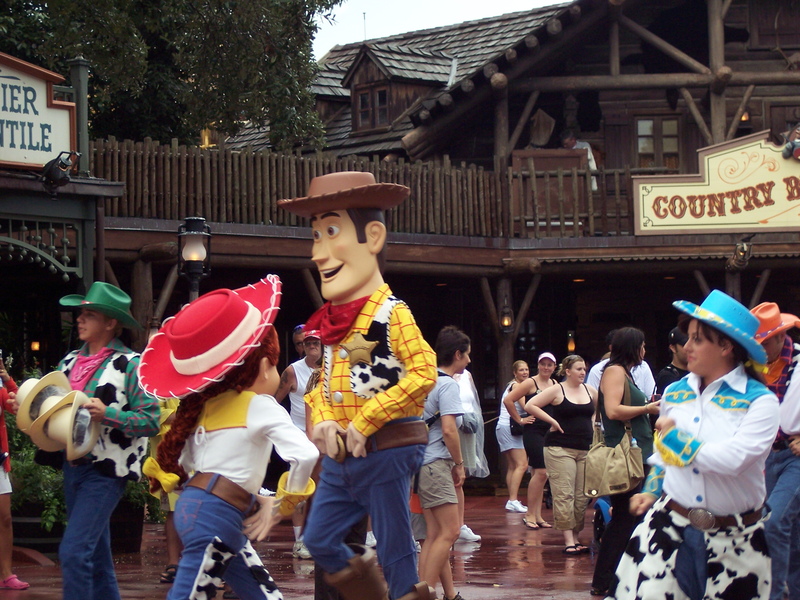 As we entered the Old West, Woody’s Wild West Round-up greeted us. At this point, my husband turned into a five-year-old boy when met with some of his favorite cartoon characters. Woody, Jesse, and BULLSEYE! Okay, I admit that I might have regressed into a little girl. After the show, we waited to get on Splash Mountain. And then it started raining…again. The ride closed for the rest of the day. So, off to Tomorrowland. We enjoyed Monsters Inc. Laugh Floor. 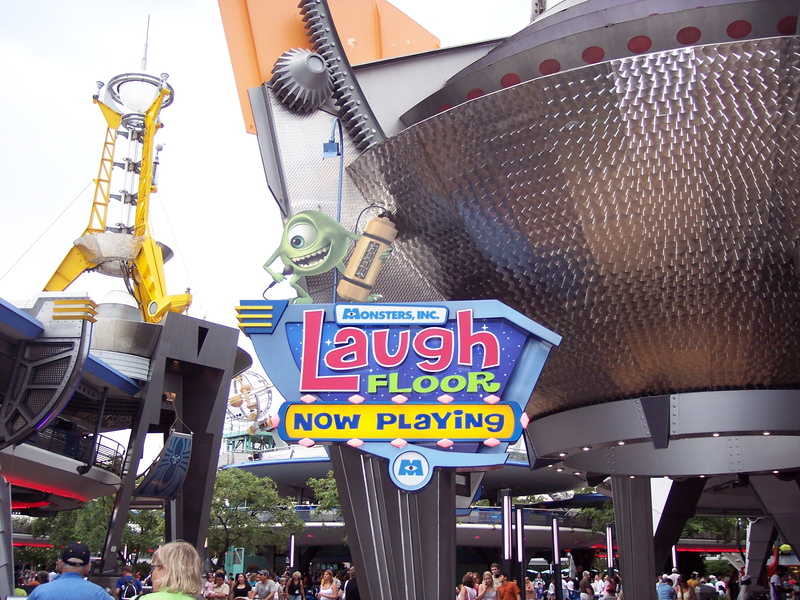 Mike Wazowski hosts Disney’s idea of the comedy club. And it succeeds! With the help of monsters, Sam an’ Ella, the interactive jokes kept the audience laughing. After all that laughing, I guess my husband felt it was time for some screaming. Before we hit Disneyworld, the closest thing to a roller coaster that I had ever ridden was Six Flags’ Log Ride. Now, I was in line to ride Space Mountain. Despite the rain, the ride remained open since it was inside a giant building. While my husband giggled like a teenager who had just played a practical joke on one of his classmates, I cringed. Earlier in the day, we had ridden Goofy’s Barnstormer. I thought that one was bad! Twisting up the halls of the mountain, I wondered what the hell I was doing here. 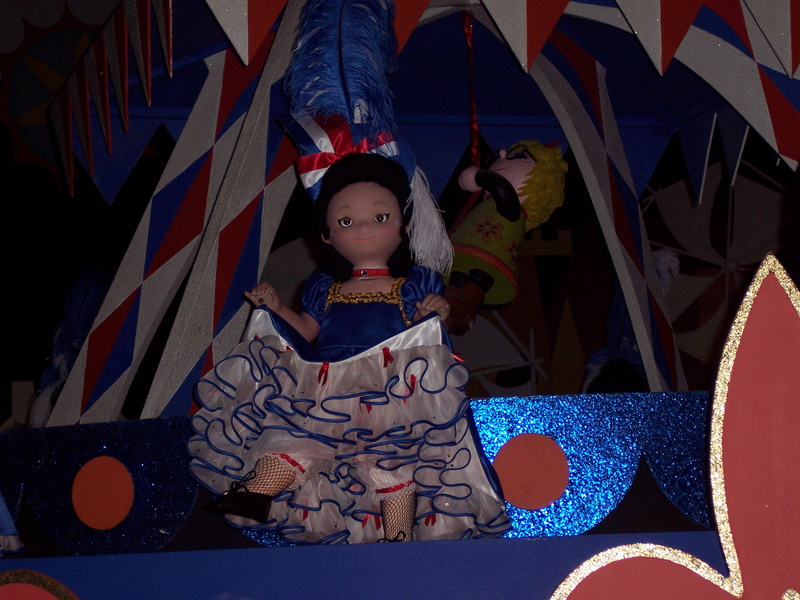 Videos from the 1970’s showed the ride in action. “I want to sit in the front,” exclaimed my husband. Not a problem, thought I. I definitely didn’t want to see my impending death from the front seat of a classic Disney roller coaster. As luck would have it, my husband got the front seat. I climbed into my seat right behind him. Will these thin metal rails support us? I didn’t see how. And then we rocketed off into a dark room, being jerked around uncomfortable turns. I swore we were going to fly off into the oblivion. They say that in space that when you scream, nobody can hear you. That didn’t stop me from screaming my lungs out. After the longest two minutes and forty-eight seconds of my life, the car pulled to a stop. Another friendly Disney attendant greeted us. Yet, I was still screaming. My husband, on the other hand, was expressing himself in a gleeful giggle. Then, I noticed the attendant was also laughing. Realizing that it was nearing time for our dinner reservation, we headed back to Colonial times in Liberty Square. We would get to dine with our favorite Disney characters dressed in Colonial fashions. After a short wait in a Colonial parlor drooling over the antique spinning wheel and the adorable Asian baby, we were seated at our table. The dinner was family style and delicious. Macaroni and cheese, mashed potatoes, vegetables, oh, and some sort of meat for my husband. Not only did we enjoy this wonderful fare but we met Mickey, Minnie, Pluto, Chip and Dale, and Goofy! It was amazing. Just because dinner ended, didn’t mean our night was over. Night fell over the Magic Kingdom but the place was still alive with action. Cinderella’s Castle became the hub of a marvelous light show, complete with Tinkerbell ziplining down from the top of the castle. 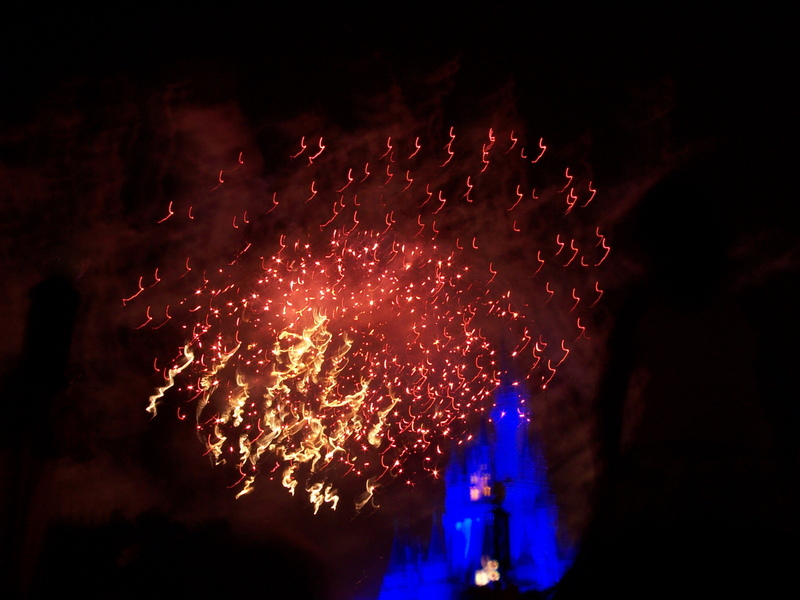 Fireworks filled the sky.Now, this completed our wonderful day at the Magic Kingdom. Back to our hotel to rest up for another day of Disney fun. These are the states I’ve visited. I think I need to get packing! create your own visited country map I found this cool create your own map link while surfing on another blog. Here are the top ten places on my travel “bucket list.” Some places I have been to but not with my husband. These are in no particular order. Feel free to post your travel bucket list. 1. The British Isles- Been to Ireland. It’s my island! 2. Poland- My mom’s family is from here so I really want to go! 9. Scandinavia- Pining for the fjords! Don’t worry, folks. “Disney Death March: Day Two” is nearly complete. Ah, honeymoons! You’ve stressed out about dresses, flowers, which relative not to seat next to, well, anyone. It’s time for you and your beloved new husband to get away from all the craziness now that the ceremony is done. After our fantabulous Tudor wedding at Scarborough Renaissance Festival, my husband and I had to continue working at said Renaissance festival for the next two months. Oh, but did we have a dream honeymoon planned. First, we would fly to Dublin; spending six glorious days exploring the Emerald Isle. Then, we’d hop a ferry from Belfast to Scotland, making our way down to London. Well, that was the plan, anyway. That was, until my uncle called. He and my aunt had just returned from seeing her family in England. Two months later, we heard about one of Disney’s special offers. 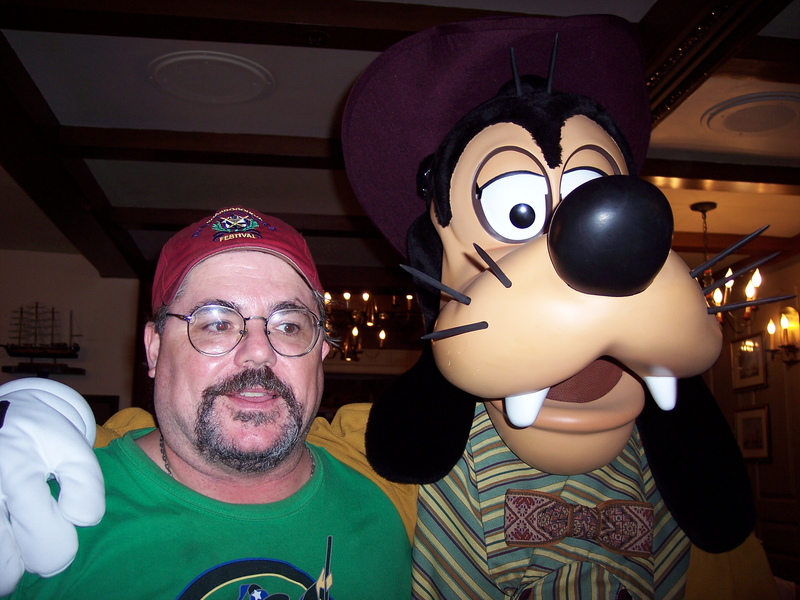 I had been to Disneyworld’s Magic Kingdom and Epcot but my husband had only ever been to Disneyland in California. “And, since we can’t see full-scale Europe this summer, we’ll just have to see quarter-scale Europe instead!” said my husband. 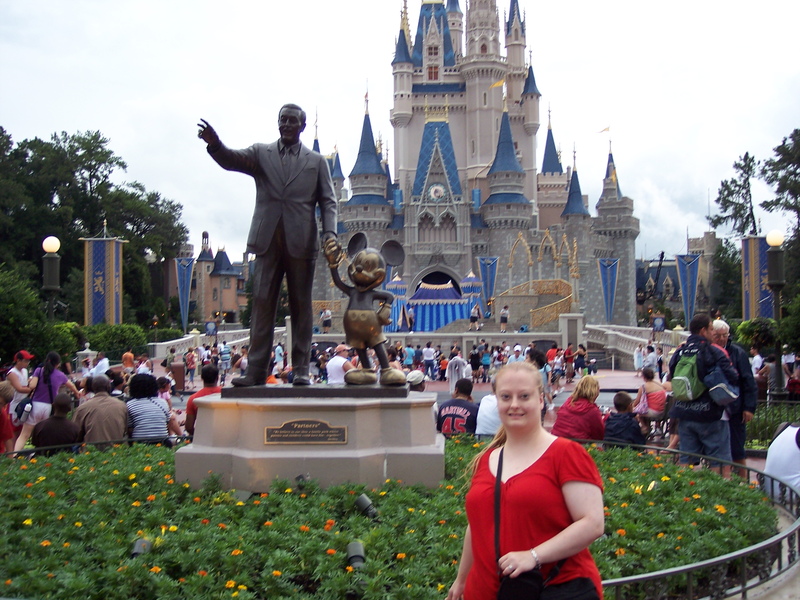 A few weeks later, after precision planning, of course, we arrive at the Mecca of family vacations…Disneyworld! After checking into our Caribbean Beach Resort room, we headed over to Downtown Disney. I booked us a reservation at Wolfgang Puck’s for dinner, so we had a few hours to kill. Let’s just walk around and see what’s here. Neither of us had been to Downtown Disney. Man, this place is huge! Tons of shops to see. 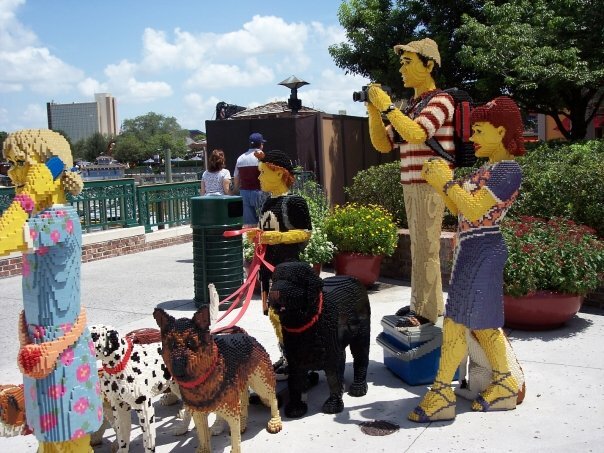 Oh, look, giant Lego sculptures. You’re never too old to enjoy Disney! While we look around, let’s just find out where the restaurant is. Here we are (far right of the map), and here is Puck’s (far left of the map.) Huh, not too bad. The map’s only a foot long. What’s this? Looking at legend at the bottom of the map, every ¼ inch represents one mile. That’s not…too much walking. We have plenty of time. We’ll just take it slow. Florida heat too much for you? We’ll just pop into one of the cool shops to check it out. 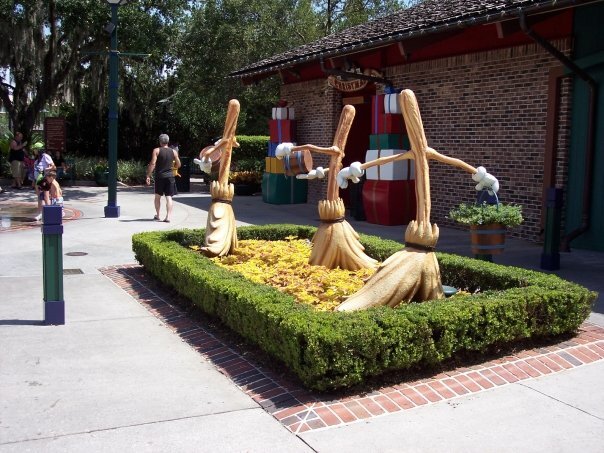 We started out near Disney’s Days of Christmas, guarded by the fantastical dancing brooms from “The Sorcerer’s Apprentice.” Nearby, kids played in Disney’s version of the lawn sprinkler. 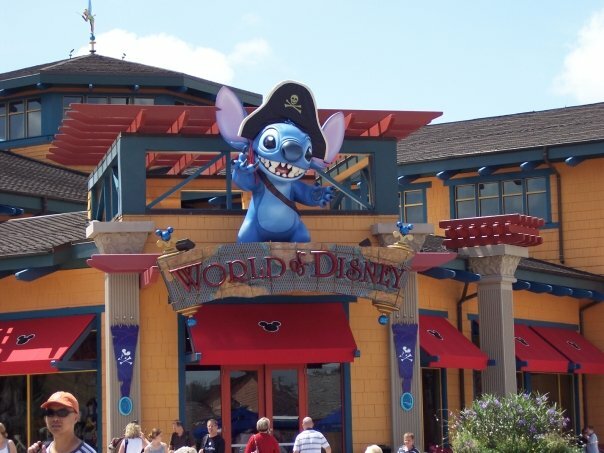 Downtown Disney is peppered with wonderful shops, such as World of Disney, Disney’s Design-a-Tee, Once Upon a Toy, and LEGO Imagination Center. LEGOS! Look, honey, every color imaginable. Of course, I had to stop and photograph every single thing, and step inside every single store. Of course, I ran out of battery for the camera. 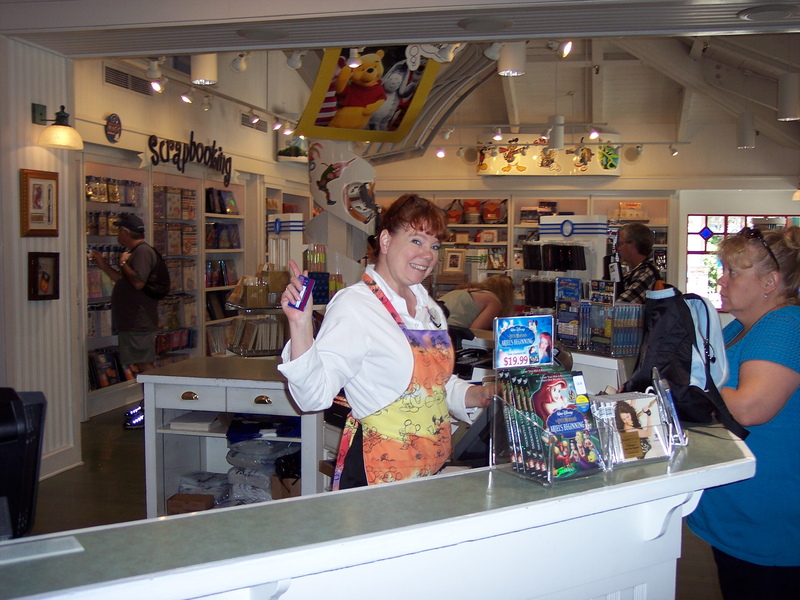 But we stopped into a souvenir shop where the very friendly saleswoman from Oklahoma City took great care of us. It’s a while before our reservation. Let’s eat at Cap’n Jack’s! My husband and I naturally gravitate to anything piratical, so naturally, we had to get our Glowing Character Punch drinks with the light-up Captain Hook straw. How cool is that?! Very cool, matey. Okay, now that we rested, we continued walking. Oohhh, music store ahead. Good, they probably have a restroom. We followed that with several more shops. Maybe we should check where we are in relationship to the restaurant. After all, two hours had already passed. Huh, we’re only half way through the map. Keep chuggin’! Eventually, we made it to Wolfgang Puck Café. Just in time because our feet were starting to hurt. Now, we could enjoy sitting in the cool air conditioning and looking at the vista. Being at a Wolfgang Puck restaurant, we knew we would be eating quite possibly one of the best meals ever! Naturally, the pumpkin ravioli was to die for! What’s that you say? It sounds like the scene from “When Harry Met Sally.” Can’t imagine what you mean. It might have been the dessert. After dinner, we headed back to the bus stop. Of course, Disney has some of the most organized transportation system ever. The bus took us right to our part of the resort. Just a short walk back to our room, and the first day of our Disney honeymoon was done. Time to rest our feet before hitting the Magic Kingdom! Rio Playlist- Let’s Get Ready for 2016 in Rio!